Click here to send Diwali Greetings! The best-known of the Hindu festivals, Diwali is celebrated throughout India at the New Moon on the fifteenth day of the auspicious month Kartika (october/november), as well as in Indian communities throughout the world. Diwali, from the sanskrit: deepãvali meaning "a garland of lamps", is the right description for this remarkable Indian festival of lights. The celebration of Diwali, a moveable feast, occurs this year on October 26 in the Western Gregorian Calendar. A harvest festival and a celebration of the Lunar New Year, Diwali (or deepãvali) has strong astrological energies, like similar festivals the world over. Basically, this is a seasonal, astrological festival marking the transition from the old lunar year to the new in Hindu India, though naturally it has lost some of this emphasis with the rise of modern urban civilisation. The celebration of Diwali, a moveable feast, occurs this year on October 26, 2011. There are many regional calendars in use in India, and though the core days for the festival are common, its timing in terms of the Gregorian Calendar can be confusing. The Indian Calendars are constructed using a combination of lunar and solar influences, taking into consideration the Full Moons in the various asterisms, or nakshatras. The calendars vary somewhat from state to state, so it can be timed (especially in the North) at the end of the month Ashwin and cross over to the beginning of Kartika. In the South and in Maharashtra, it is celebrated in the middle of Kartika, as the South marks the lunation as the middle of the month, and the North marks it as the end of the month. The celebration takes different forms in different parts of India, but we will start with the flavour of the North. In North India, the lamps are lit to remind the community of Rama's return to his kingdom of Ayodhya after fourteen years in exile. During this time Rama, one of the main figures of devotion in the Hindu faith, conquered the tyrant Ravana, who had abducted his wife Sita and held her in his island fortress of Lanka. Rama's heroic deeds are set out in the epic poem Ramayana and so, at least in this regard, Diwali celebrates the victory of virtue over vice. In the story, Rama, the rightful heir to the throne of Ayodhya, accepts exile in the forest due to his father's vow to his scheming stepmother. He is accompanied in his exile by his lovely wife Sita and his brother Lakshmana. The Ramayana is the story of his conquest of evil with the aid of Hanuman, the monkey king, and the undying love of Sita. The symbolism of the story of Rama goes beyond the scope of this article, but it is one of the most powerful and enduring love stories of all time, and is cherished by the Indian people. As with other Indian festivals, Diwali signifies many different things to people across the country. While in North India Diwali celebrates Rama's return to Ayodhya after the defeat of Ravana and his coronation as king, in Gujarat, the festival honours Lakshmi, the goddess of wealth and in Bengal, it is associated with the goddess Kali. For Jains, the day commemorates the passing into Nirvana of Mahavira, the most recent of the Jain Tirthankaras, or saints. The lighting of the lamps is explained as a material substitute for the light of holy knowledge that was extinguished with Mahavira's passing. Sikhs celebrate Diwali to express joy at the return of the sixth Guru to Amritsar in 1620; Emperor Jahangir had imprisoned him along with 52 Hindu kings. The Guru was granted freedom, but refused to leave until the kings were also released. The worship of Lakshmi and Ganesha is also celebrated throughout the country at this time. It signifies the renewal of life, so it is the done thing to wear new clothes on the day of the festival. It seems to have begun as a harvest festival, yet, as the beginning of the lunar New Year, it also heralds the approach of winter and the start of a new sowing season. By the Western Gregorian calendar, Diwali falls in October or November; in 2010, it occurs on November 5, but Diwali is actually a five day festival, beginning on the 15th day of the Hindu calendar month of Kartika. Gifts are exchanged and festive meals are prepared during Diwali and the celebration means as much to Hindus as Christmas does to Christians. Diwali marks the beginning of the Hindu and Gujarati New Year and is celebrated with the lighting of lamps and candles — and lots of fireworks. It is the traditional time to replenish wardrobes with new clothes and exchange gifts (often clothes) and sweets with friends and neighbours. 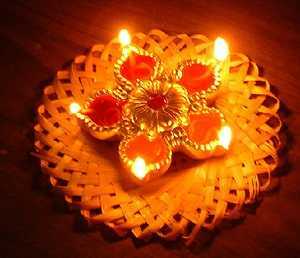 Because there are many regions in India, there are many manifestations of the Diwali celebration. The festival begins with Dhanteras, a day set aside to worship the goddess of prosperity, Shri Lakshmi. Lustrous Lakshmi is the consort of Vishnu and her statue is found in every home. On this day, the homes of the faithful are thoroughly cleaned and windows are opened to welcome her blessing for the new year. In rural villages cattle are adorned and worshipped by farmers and, in the South of India, cows are offered special veneration as the incarnation of the goddess. Candles and lamps are lit as a greeting to Lakshmi. In Indian culture, wealth is not viewed as a corruptive power. Instead, a wealthy person is believed to have been rewarded for the good deeds of a past life. On this day, people exchange gifts and purchase new items for the house, as this is considered auspicious, ensuring happiness and prosperity for the whole of the coming year. Businessmen (marwaldi) pray for prosperity on this day to Lakshmi to give them the best results for the year ahead. On the second day Kali, or Shakti, the goddess of power, is worshipped. Kali is power, or strength used for the protection of others, and Maha-Kali (supreme power) is the power of the divine force in the dance of destruction. This day celebrates the destruction of the demon (asura) Raktabija. Another myth recalls the defeat of Narakãsura, the demon-king of Prãgjyotishapura (present day Assam). His yogic powers had fattened his ego, so he had become a menace to the people. He saw women as no more than a means fulfilling his desires and had 16,100 in his harem. The Gods implored Sri Krishna to rescue them from this fiend. Sri Krishna came from Dvaraka and destroyed Narãksura's huge army, finally beheading Narakãsura himself. The population was freed from the oppressive tyranny and everyone heaved a sigh of relief. All the women kept by the demon king were freed, and to preserve their social virtue, Sri Krishna made them all, at least nominally, his wives! Diwali celebrates the end of the harvest, known as the Kharif when the fresh crop of rice is in, but also marks the beginning of the new season. Delicacies are prepared from pounded partly-cooked rice (called Poha or Pauva) from the recent harvest. This custom is held in rural and in urban areas, especially in Western India. 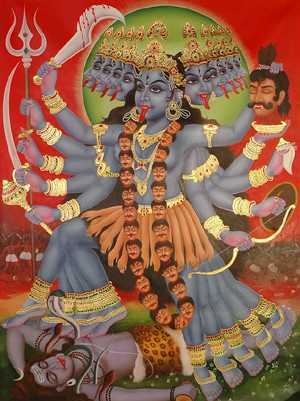 This day (Kali Chaudas) also focuses on abolishing laziness and evil. North Indians call it Narak Chaudas and pray for the souls of departed loved ones. On the third and most important day — the last day of the year in the lunar calendar — lamps are lit, shining brightly in every home. The lamp shining at the dark of the New Moon symbolizes knowledge and encourages reflection upon the purpose of each day in the festival. The goal is to remember this purpose throughout the coming year. Lakshmi Puja (ceremonial worship) is performed on this day, awakening an appreciation of prosperity and a sense of responsibility towards it. Lakshmi, always depicted as a very beautiful woman, stands on a lotus. She has lotuses in various stages of bloom in her two hands and wears a lotus garland. Cascades of gold coins are usually shown flowing from her hands, suggesting that those who worship her gain wealth. She always wears gold-embroidered red clothes, as red symbolizes activity and the golden lining indicates prosperity. Lakshmi is the active energy of Vishnu (the maintaining power of the universe), and also appears as Lakshmi-Narayan – Lakshmi accompanying Vishnu. Lakshmi is the Goddess of Wealth and Ganesha is the Lord of Happiness. Lakshmi and Ganesha Puja is performed for prosperity, material abundance, and spiritual prosperity. 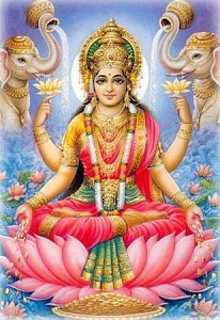 The faithful believe that the worship of Lakshmi should not be neglected, lest poverty and suffering fall upon those who fail to remember her. This Puja is performed in the evening, as the Taurus ascendant and the Leo ascendant are considered the best for preserving material benefits for the year. At this time, old business accounts are settled and new books are opened. The books are worshipped in a special ceremony and participants are encouraged to remove anger, hate, and jealousy from their lives. The fourth day of Diwali falls on the first day of the lunar New Year and is called Vishkarma Day. Also known as Padwa or VarshaPratipada it marks the coronation of the legendary King Vikramaditya. Families celebrate the new year by dressing in new clothes, wearing jewellery and visiting family members and business colleagues bearing sweets, dried fruits and other gifts. This day is often used by manufacturers to pray for their equipment so that it works well and makes profit during the year ahead. In ancient times, the people of Gokul would celebrate a festival in honour of Lord Indra, worshipping him at the end of each monsoon season. However, in one particular year, the young Krishna halted the custom of offering prayers to Indra — who had in a fit of anger poured down a deluge to destroy Gokul. Krishna saved Gokul from the deluge by lifting up a mountain called Govardhan and holding it over the people as an umbrella. So, on this day, Govardhan Puja is performed to commemorate this feat by Shri Krishna. This day is also observed as Annakoot and prayers are offered in the temples. In Mathura and Nathadwara, the deities are bathed in milk, then dressed in shining attire, featuring ornaments of diamonds, pearls, rubies and other precious stones. On the final day (Balipratipada) of the festival, Bali, a titanic figure in Indian Mythology, is recalled. Bali was the powerful demon-king of Paataala (the netherworld), who had boldly extended his kingdom over the earth as well. On this day Shri Vishnu, taking the form of Vaamana, a dwarfish Brahmin, approached Bali requesting a boon comprising the amount of space equal to three of his steps. Bali, famed for his generosity, granted the boon. However, the "dwarf" then grew into a gigantic form and with one step covered the entire earth; with the second he covered the sky — and then asked Bali where he should place his third step. Bali, left with no other choice, presented his own head. Shri Vishnu placed his foot on Bali's head, pushing him back down to the netherworld, the rightful territory of Bali's reign. However, Bali prayed that he might be permitted to visit the earth once a year. Then it was the turn of Vishnu to grant the boon. Thus, the focus of this day is to see the good in others, including enemies. It is particularly reverenced in Kerala. The second day of the bright fortnight (Shukla Paksh) of Kartika is also called Bhaiya-Duj. In the Vedic era, Lord Yama (Yamaraj, the Lord of Death) visited his sister Yamuna (Yami) who marked the auspicious Tilak (sacred mark) on his forehead. They dined and talked together, enjoying each other's company, exchanging special gifts as a token of their love for each other. Yamaraj declared that anyone who receives the Tilak from his sister on this day is truly blessed. Since that time the custom has been for brothers to visit their sisters to celebrate Bhaiyaduj. The 'Teeka' is applied on the brother's forehead, but it is primarily a day dedicated to sisters. Raksha Bandhan may be "brothers' day", but this is "sisters' day". The Tilak is marked in sandal paste (Vishnu), sacred ash (Shiva) or red turmeric (Devi/Shakti) on the forehead between the eyebrows at the Ajna Chakra, the "Third Eye" (the material varies according to the object of veneration of the devotee). The third eye is considered the eye of wisdom and the opening of this potent energetic factor, the destroyer of karma, is the focus of a great deal of religious, yogic and tantric concentration. In such a diverse nation as India, there are many many intertwining myths, swathed in a variety of interpretations. Another myth traces the origins of the festival to the annual "inspection tours" of Lakshmi, the Hindu goddess of wealth and prosperity. The faithful believe that on this day Lakshmi goes around visiting her devotees, setting up residence in the house she finds best spruced up and most hospitable. Diwali is an occasion for spring cleaning, painting the walls, decorating the floor with attractive designs wrought in coloured powder, or paste made with rice. Both Shri Krishna and Shri Rama are believed to be avatars (incarnations) of Shri Vishnu, the great maintainer of existence in our universe. The slaying by Krishna of the demon lord Narakasura after a long march from Dvaraka (in Gujarat) in the West to Pragjyotishapura (in Assam) in the East and the overcoming by Rama of the demon king Ravana in Lanka in the South and his triumphant march back to Ayodhya in the North is held to represent the unification of the four corners (North, South, East and West) of the land of Bharata Varsha (India) through the triumph of good over evil. Rama is venerated especially in the North, while Krishna is more favoured in the South. This unification under God is said to be the source of the underlying joy that surfaces at this festival. More esoterically, or at a deeper level, the festival symbolises the victory of light over darkness and reminds us of the inner spark of divine light that lies in our hearts. The sense of coming home after a prolonged absence points us towards the inner light that is the central point and goal of the journey to self-realisation which lies at the heart of all religion. Interestingly, the chief ritual traditionally associated with Diwali is gambling. The lottery business thrives! Friends get together to indulge in games of chance, dice or cards. The "addicts" seek a kind of legitimacy for their pastime by referring to the celestial game of dice played by the great Lord Shiva with his companion Parvati — a scene superbly sculpted at the Kailash temple in Ellora. Others rationalise that this is just to remind us of the fickleness of lady luck and to inculcate a sense of balance in our pursuit of material success. As already mentioned, the spiritual emphasis at Diwali is upon Shri Rama in the North, but is more upon Shri Krishna in the South. In every part of India, however, the blessings of Shri Lakshmi (wealth) and Shri Ganesha (happiness) are eagerly sought, whether through puja, or just taking a punt! Why not send an E-Card for Diwali from our sister-site, TruthStar.com! Click Here. Hindus believe that making puja (worship) to the goddess Lakshmi on Diwali day invokes her blessing. This ensures wealth, prosperity and progress throughout the year. Please Click Here to learn about the Diwali Puja Process.